This is not an emergency per se, but something that can be a little uncomfortable or embarrassing for the student. It is easily resolved with a piece of dental floss. Try tying a small knot in the middle of the floss to help remove the food. Or use an interproximal brush or toothpick to dislodge food. 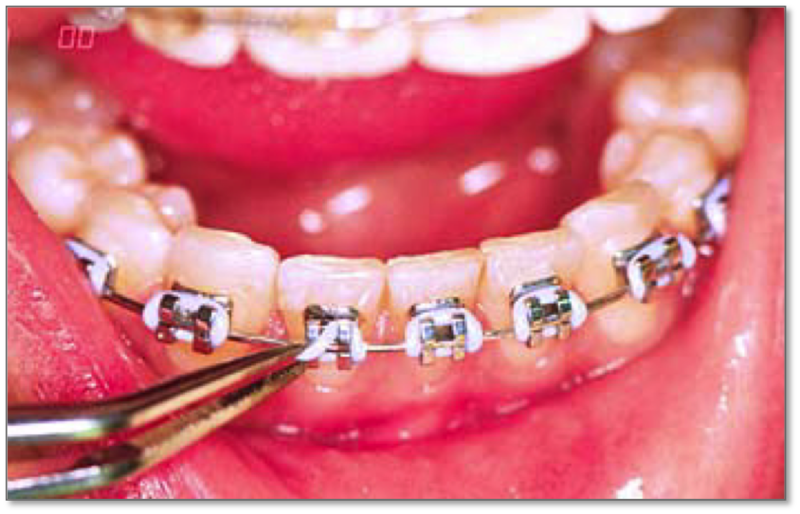 If an elastic ligature should come off, you may be able to put it back into place using sterile tweezers. Stretch it over and around the bracket to secure it. If the patient has a wire ligature that is sticking out into the lip or other soft tissue, but the wire itself is not loose, simply bend it down with a Q-tip or even a pencil eraser. That will eliminate the irritation. In either case, call us to see whether the patient will need to be seen. It’s important for us t to be notified because sometimes if one ligature pops off or breaks, others may follow. Mouth sores are not a true emergency, either, but they do warrant attention because they can be very uncomfortable for the patient. You may see ulcerations in one or more areas. Ulcerations can appear inside the cheeks, or on the lips or even on the tongue. You can alleviate the discomfort by applying a small amount of a topical anesthetic directly to the ulcerated surface area using a cotton swab, re-apply the topical anesthetic as needed. You can can get topical anesthetic from most pharmacies such as Orajel. If irritation of the lips and/or cheeks is a problem, turn to orthodontic relief wax for help. Pinch off a small piece of wax and roll it into a ball about the size of a pea (note: don't use too much wax or it will just fall off the braces). 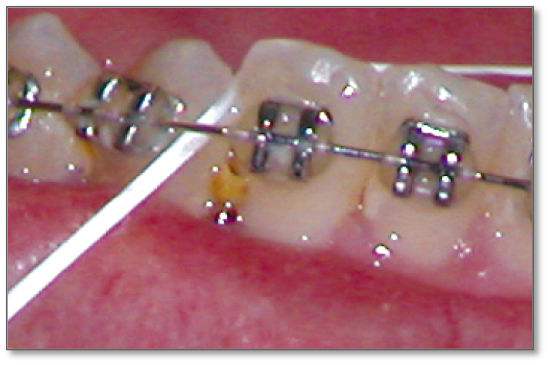 Flatten the ball and place it comfortably over the area of the braces causing irritation. The patient may then eat lunch more comfortably. Let the student know that if the wax is ingested it’s not a problem. The wax is harmless. Occasionally the end of a wire will work itself out of place and irritate the patient’s mouth. Use a Q-tip or pencil eraser to push the wire so that it is flat against the tooth. Please call us to repair the problem. In the meantime, if the wire can’t be moved into a comfortable position, cover it with relief wax. In a situation where the wire is extremely bothersome and the patient will not be able to see us anytime soon, as a last resort, you may clip the wire. Reduce the possibility of swallowing the wire by using a folded tissue or gauze around the area. Use a pair of sharp clippers and snip off the protruding wire. Relief wax may still be necessary to provide comfort to the irritated area. Brackets are generally positioned in the center of each tooth. 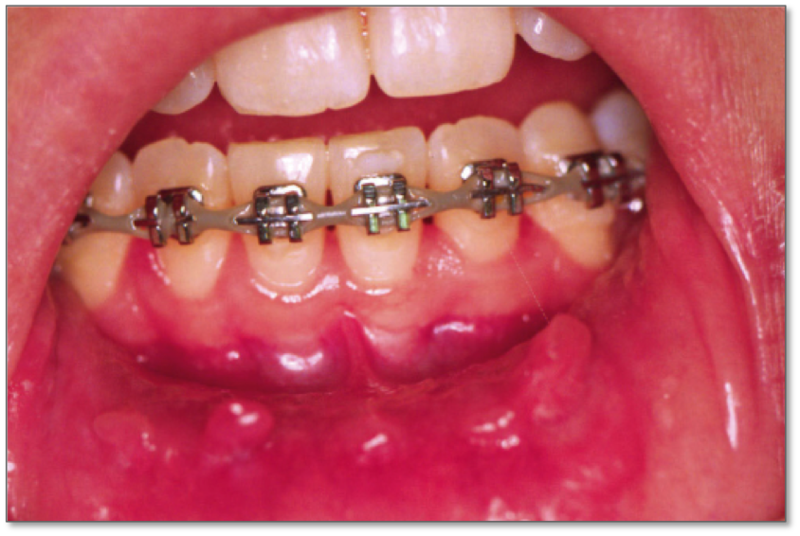 The bracket can be knocked loose if the student has eaten hard or crunchy foods, or if the mouth is struck while at play. In general, these are not true emergencies. You may call us to repair the broken bracket, sometimes we can do them during your next orthodontic adjustment appointment. But please be sure to let us know before you come in so we can prepare for the repair. This is rare, but when it does happen, it can be fairly alarming. Encourage the patient to remain calm. If the patient is coughing excessively or having difficulty breathing, the piece could have been aspirated. If you are unable to see the piece and believe it may have been aspirated, call 911, then notify the orthodontist immediately. The patient should be taken to an urgent care facility for an x-ray to determine the location of the piece. A physician will have to determine the best way to remove it. 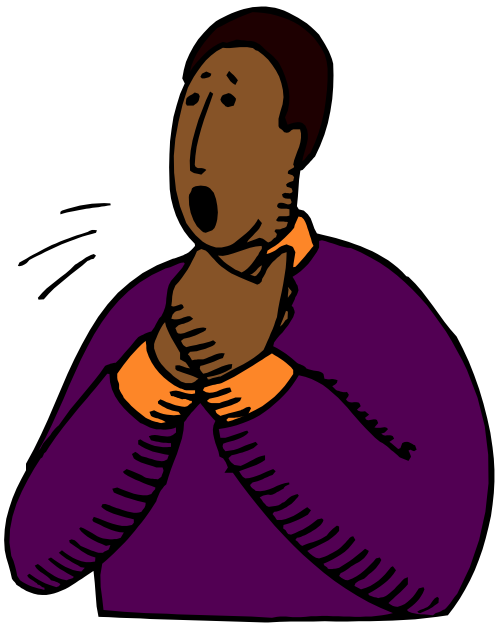 If there is no coughing difficulty in breathing, call 911 for advice or instructions and inform the orthodontist. You may attempt to push the extruded or luxated tooth gently back into the socket. Call your dentist or pediatric dentist immediately. Early stabilization to the injured tooth will significantly help in reattaching itself. A tooth may be saved if cared for properly and re-implanted as soon as possible. Timely treatment may improve the chances of re-attaching a knocked out tooth. Call your dentist or pediatric dentist for immediate attention. Locate the tooth, hold it by the crown (the wide part, not the roots). Remove large pieces of dirt or debris while avoiding touching the root. Rinse the tooth, do not scrub. Plug the sink hole to prevent the tooth from going down the drain accidentally. Attempt to gently put the clean tooth back in its socket. cover with gauze or tissue and bite down to stabilize it. Or hold the tooth it is socket until seen by a dentist. If tooth can't be placed into its socket, store it in a suitable liquid until seen by the dentist. 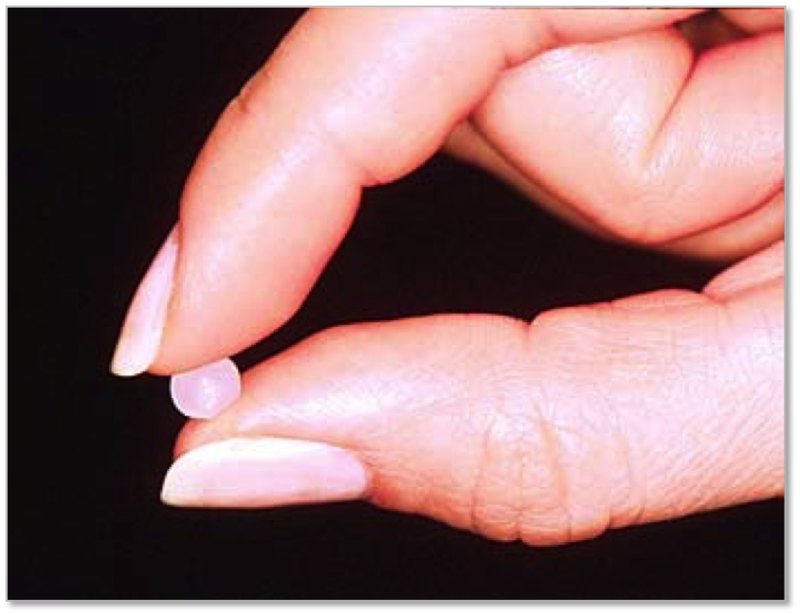 Put the tooth in milk or sterile saline solution (contact lens solution with no preservative). Do Not store in water because the water will kill the vital cells on the surface of the roots reducing any chance of successful re-implantation. If milk or sterile saline is unavailable, store the tooth in the cheeks where saliva will help provide vitality to the root surface (be careful not to swallow tooth). More importantly, do not let the tooth dry out. Restrict diet to soft foods and if no improvement occurs within 24 hours, seek dental care to rule out subtle injuries. If in doubt, contact your dentist or seek medical attention.